As some of you know, Mr. and I recently returned from a cruise. At breakfast on the last day, we sat with a couple we didn’t know. After our good mornings, I asked, “How are y’all?”. The gentleman immediately replied, “you must be from Oklahoma or Texas”. (he was an Oklahoma transplant originally from California) I love living in an area where someone knows where you are from by just saying one word! And if any of y’all are wondering….yes, we are! Born, raised, and lived in Oklahoma until 10 months ago when we moved to Texas! Mr. and I are still trying to recover from our vacation and get back into the swing of things. He really dreaded putting on slacks and socks yesterday, instead of shorts and flip flops! Five years ago, you would have never caught Mr. in a pair of flip flops. But now-a-days, they are a way of life! And that is the atmosphere I’m hoping to create for our home here in Texas. Relaxing, fun, and beachy. 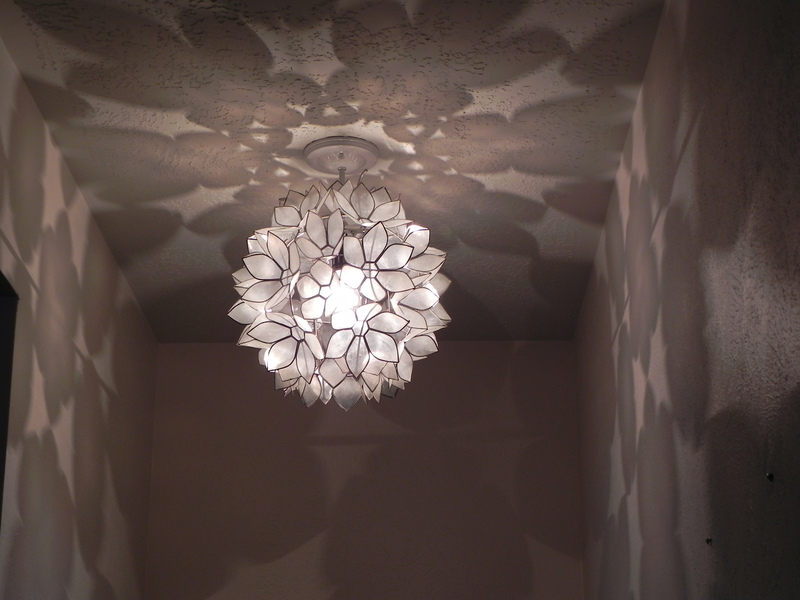 So this weekend, we worked on a lighting project for the hallway between our bedroom and the guest bathroom. A couple of weeks ago, I was at Home Goods and I saw a tea light chandelier made out of capiz shells. Absolute gorgeousness! The only thing is, I didn’t buy it. That is a huge mistake I have made in the past at Home Goods. 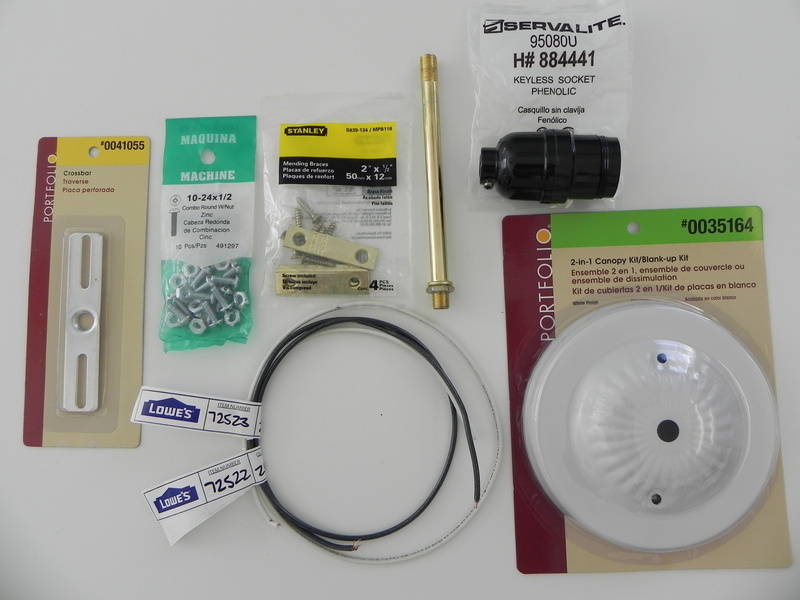 If you see ANYTHING that you think you might want, you MUST buy it right then! Why, you ask? Because it will be gone when you decide that you really do want it and go back for it! This has happened more than once to me. Anyhoo, a few days later, I saw this on Pinterest and was completely ecstatic!! I’m thinking, “Oh my gosh, that’s the light at Home Goods with directions on how to turn it into a light”! Then reality sets in and I remember I didn’t buy it! But in the back of my mind I’m kind of thinking it might still be there. I make a mad dash to Home Goods with no such luck. But I did get a really cute orange, wire basket for my laundry room! As I’m checking out, I decide I’m going to try one more store and see if they might have one. So off to Katy I drive, which is about 30 minutes away. And lo and behold, THEY HAD ONE,,,,AND a little one to match! 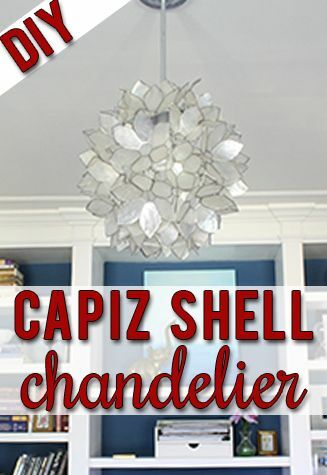 And what’s a girl to do when she finds two capiz shell, tea light chandeliers? Buy both! Which is what I did. When Mr. got home that evening, I showed him my prized possessions of the day and how we can make them into chandeliers. So this past weekend, that is what we did. This is the light that we started with. Ugly and boring, right? 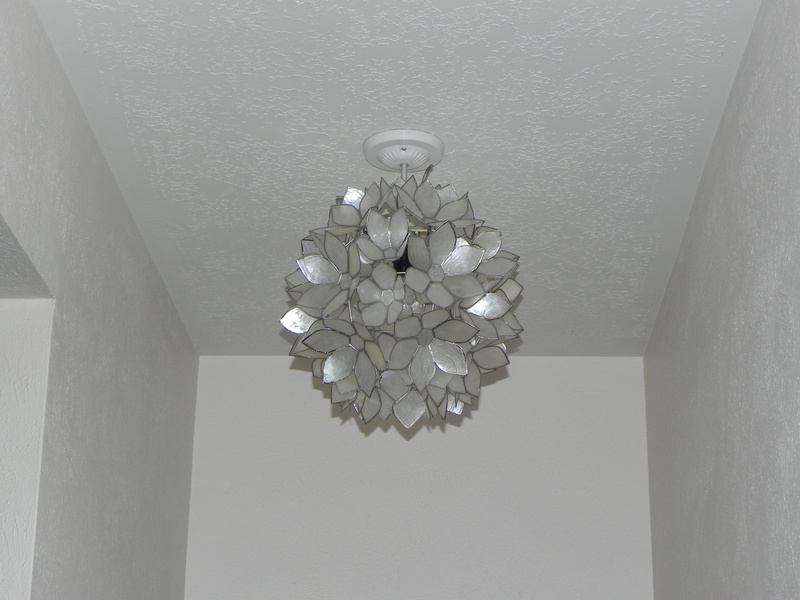 We used the directions from the above pin from Pinterest just as a guideline, as Mr. used different items to mount the light socket inside the chandelier. 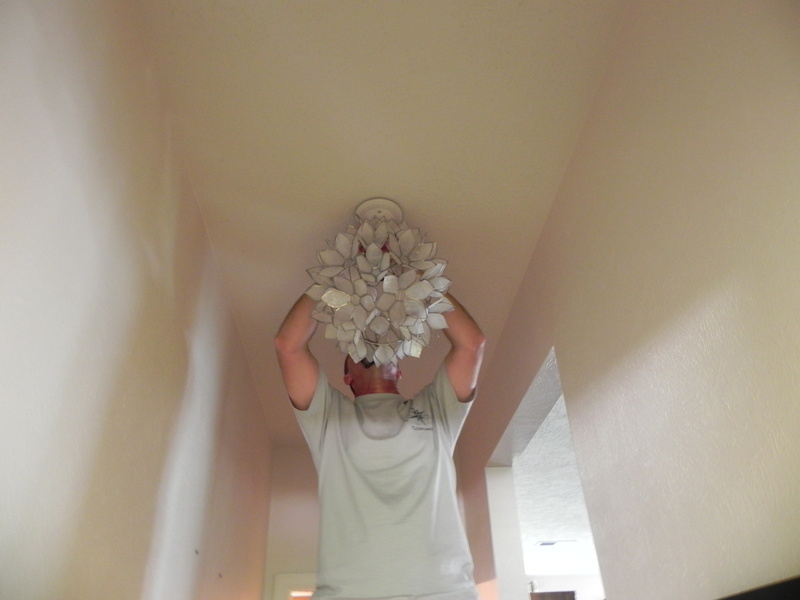 We started by removing the tea lights from inside of the chandelier. 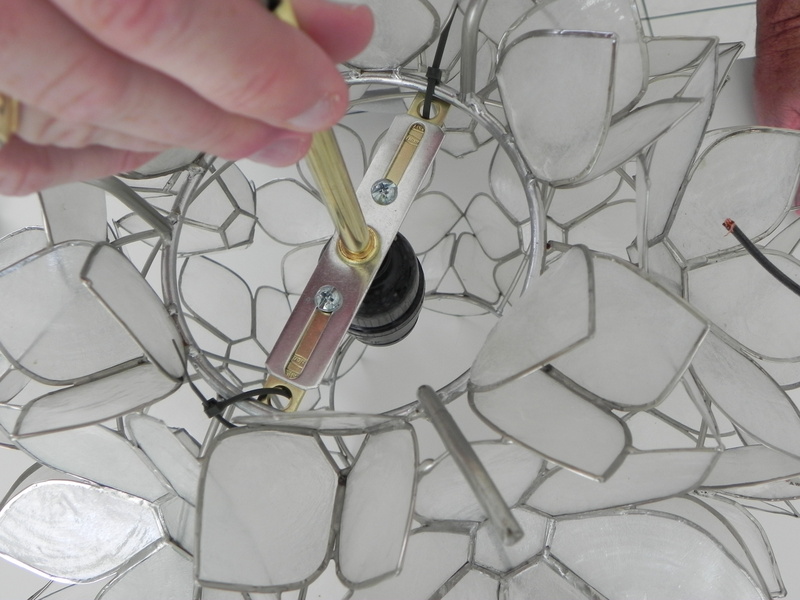 We pulled the wires through the ceiling canopy and tightened it to the rod with a washer and nut. 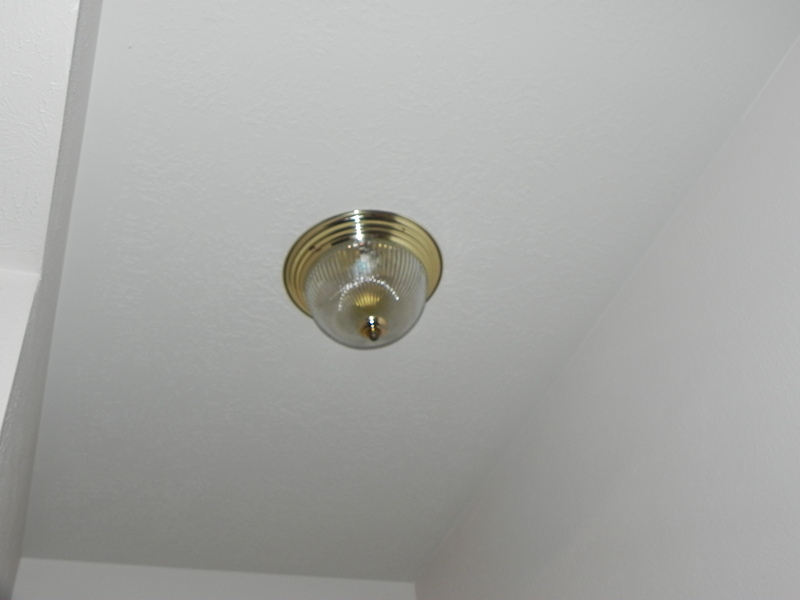 Mr. wired the light in the ceiling and attached the canopy to the ceiling. All in all, it took less than two hours from start to finish. I’m so excited about my new light. I love the design it showers on the walls and ceiling at night! 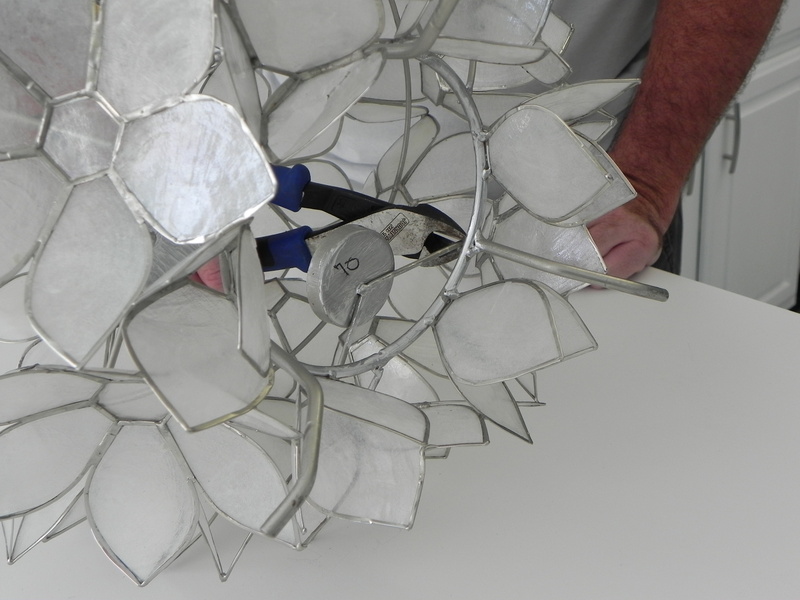 Sort of like a disco ball, don’t you think? This entry was posted in DIY & Crafts and tagged capiz shells, cruise, diy, home, Home Goods, lighting, Oklahoma, Pinterest, repurposed, Texas. Bookmark the permalink. ← The Beach is Always Calling My Name! OMG! Love it! You guys are so crafty!